Here we will prove that the equal sides YX and ZX of an isosceles triangle XYZ are produced beyond the vertex X to the points P and Q such that XP is equal to XQ. QY and PZ are joined. Show that QY is equal to PZ. In ∆XYZ, XY = XZ. 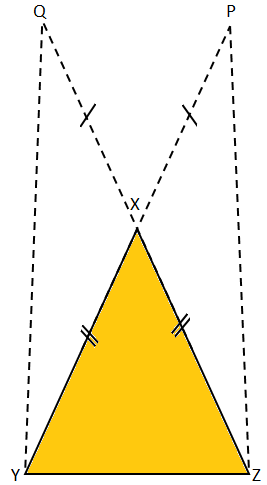 YX and XZ are produced to P and Q respectively such that XP = XQ. Q, Y and P, Z are joined. To prove: QY = PZ.